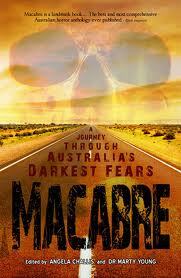 SpecFicNZ member Marty Young, co-editor of Macabre; a Journey through Australia’s Darkest Fears, has some great news. Macabre has made the final ballot of the 2010 Bram Stoker Awards for superior achievement in an anthology. In addition to that wonderful accolade, Kirstyn McDermott‘s Macabre story ‘Monsters Among Us’ has also been nominated for a Stoker in the Long Fiction category. AND the anthology has been short listed for the 2010 Australian Shadows Award, with Andrew McKeirnan‘s story ‘All the Clowns in Clowntown’ likewise shortlisted in those awards for Best Short Fiction. Finally, Richard Harland‘s story from Macabre, ‘The Fear’, will be reprinted in Ellen Datlow‘s Best Horror of the Year 3! All that is to say, if you’d like to read some good Horror, we know where you can find some.